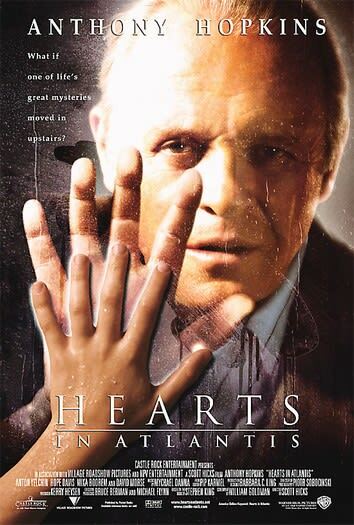 Hearts in Atlantis tells the story of Robert "Bobby" Garfield, a middle-aged man recollecting his past, in particular the summer when he was eleven years old. During that summer, he and his two friends, Carol Gerber and John "Sully" Sullivan, experienced many things together, the most mysterious of which was meeting an older gentleman named Ted Brautigan. Bobby lives with his single mother, the self-centered Liz Garfield, who takes in Brautigan as a boarder. Ted takes the lonely Bobby under his wing, while his mother is busy with her job — including entertaining her boss as a way of paying off debt supposedly left by Bobby's late father. The two form a paternal father-son bond, and it slowly becomes evident that Ted has some psychic and telekinetic powers. These same powers are the reason that Brautigan has come to this sleepy town. In due course Ted entrusts Bobby with the knowledge that he has escaped the grasp of the "Low Men", strange people who would stop at nothing to get him back in their control. Read more on Wikipedia.